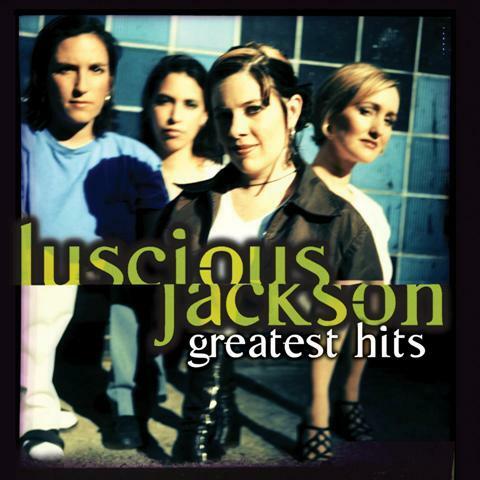 Greatest Hits is a compilation album from New York alternative rock group Luscious Jackson, released on the Capitol label on Feb 20, 2007 (see 2007 in music). Released by Capitol, only one of the tracks from their Grand Royal debut EP, In Search of Manny made the cut. The album was released seven years after the break up of the band and on the same day as Jill Cunniff solo debut, City Beach. Luscious Jackson was an Alternative rock group formed in 1991. They are named after now-retired American basketball player Lucious Jackson. The original band consisted of Jill Cunniff (vocals, bass), Gabby Glaser (vocals, guitar), Kate Schellenbach (drums) and Vivian Trimble (keyboards, vocals). The band played nearly every instrument heard on their records, and with the exception of a few non-LP cover songs wrote all of their own material, the majority penned by vocalists Jill Cunniff and/or Gabby Glaser. Between 1993 and 2000 they released one EP, three full length LPs and ten singles on the Beastie Boys' Grand Royal record label. Their biggest hit—and only Billboard Hot 100 entry—is "Naked Eye" ( March 22, 1997). Other notable singles include "Daughters Of The Kaos", "CitySong (NY State Of The World)", "Under Your Skin" and "Ladyfingers". Vivian Trimble left the group in 1998, and in 2000 (after releasing one album as a trio) the group announced their break up. February 2007 saw the release of Luscious Jackson's "greatest hits" compilation. In 1991, Jill Cunniff and Gabby Glaser created the first Luscious Jackson demo with tip money from their restaurant jobs. Their first live performance was opening for Beastie Boys and Cypress Hill at the now-defunct Building in lower New York City. The Beastie Boys asked Luscious Jackson to be the first band on their Grand Royal label. Former Beastie Boys band member Kate Schellenbach soon joined the band on drums, and Vivian Trimble took keyboard and backing vocal duties. Three tracks from the original Luscious Jackson demo and four new songs were released in 1992 as the In Search of Manny EP. "Let Yourself Get Down" and "Daughters Of The Kaos" were issued as promotional singles. A video was also filmed for the ISOM track "Daughters of the Kaos". After previewing two new recordings from their forthcoming album on the promotional Daughters Of The Kaos EP, Luscious Jackson released their first full length LP for the Grand Royal label, Natural Ingredients (1994). The album spawned three minor hits with "CitySong (NY State Of The World)," "Deep Shag" and "Here", the latter featured in the Alicia Silverstone film Clueless. In addition, all three singles had music videos which could be seen on MTV. The years 1994 and 1995 brought continued success for the band. They took part in the Lollapalooza tour and were the musical guest on numerous television shows including Saturday Night Live, Viva Variety and MTV's 120 Minutes. They were also featured in a fashion segment on MTV's House of Style with Cindy Crawford and on the Nickelodeon TV series The Adventures of Pete and Pete in the episode titled "Dance Fever". The band performed "Angel," "Satellite," "Pele Merengue," and "Here" at Little Pete's first junior high dance. While on tour in 1995, Trimble and Cunniff recorded a collection of mellow, acoustic driven songs under the name Kostars titled Klassics With A "K". The album was released in 1996 and featured contributions by Kate and Gabby as well as Gene and Dean Ween of Ween and was produced by Josephine Wiggs, bass player of The Breeders. The time between 1996 and 1997 was Luscious Jackson's most commercially successful period. While promoting the release of their second full-length album Fever In Fever Out (produced by Daniel Lanois), they scored their first Billboard Top 40 Hit "Naked Eye". Two follow up singles were released, "Under Your Skin" and "Why Do I Lie?," which was featured in the Gus Van Sant film Good Will Hunting. During this time, Luscious Jackson's "Nice Duds" fan club members received a 10-track CD album of demos and live rarities titled Tip Top Starlets. In 1998 Luscious Jackson recorded George Gershwin's "I've Got a Crush on You" for the Red Hot Organization's compilation album Red Hot + Rhapsody, a tribute to George Gershwin, which raised money for various charities devoted to increasing AIDS awareness and fighting the disease. Luscious Jackson were featured in an ad campaign for The Gap throughout 1998 and 1999. Their Christmas ad "Let It Snow! Let It Snow! Let It Snow!" was voted the most popular of the campaign in TV Guide. Tired of touring and wanting to pursue other musical projects, Vivian Trimble left Luscious Jackson and was replaced by Singh Birdsong. Two years later Vivian Trimble and Josephine Wiggs (formerly of The Breeders) released an album under the name Dusty Trails. Returning to 1999, Luscious Jackson (recording as a trio) released their third full-length LP Electric Honey. The single "Ladyfingers" was a moderate success with the video put into heavy rotation on VH1. "Ladyfingers" was also featured in the Buffy the Vampire Slayer episode "Beer Bad". A second single "Nervous Breakthrough" was issued without a music video or commercial single release. Plans for a third single from Electric Honey, "Devotion" were scrapped as interest in the album waned, though a radio/single remix was prepared. In 2000, Luscious Jackson announced they would no longer be recording or touring. In 2006, Luscious Jackson announced plans to reunite to record a new album of songs for children; by September of that year, the band had completed eleven tracks for the album, and was seeking a label to release it; it was untitled, though Cunniff told MTV she wanted to call it It's All Goo. In February 2007, Capitol Records released a Greatest Hits album. On February 20, 2007, vocalist/bassist Jill Cunniff released her first solo album, City Beach, on The Militia Group label. On June 26, 2007, vocalist/guitarist Gabby Glaser released her debut solo album, Gimme Splash on Latchkey Records. The following songs were issued as singles commercially and/or promotionally (to radio/clubs). Many of these songs had accompanying music videos. *Let It Snow! Let It Snow! Let It Snow! The following are recordings that do not appear on Luscious Jackson albums. The majority were issued on various artist compilations, film soundtracks or on one of Luscious Jackson's single releases.